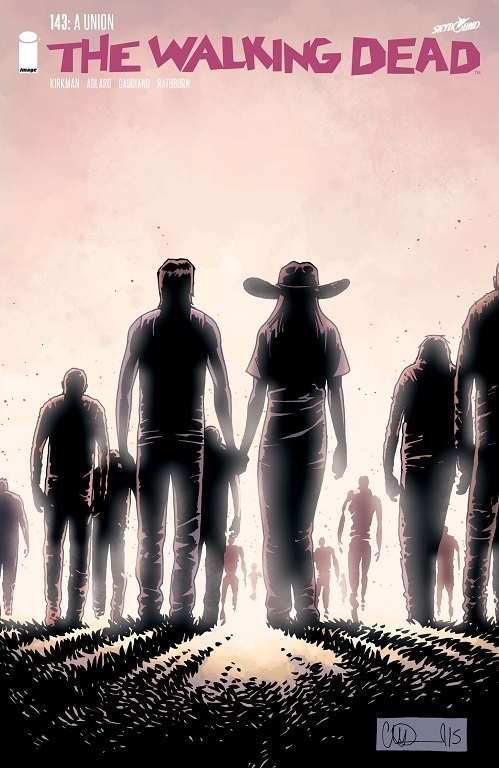 A Look at The Walking Dead #143: “A Union” | What Else is on Now? Have you ever wondered what it would be like if Rick and Carl had a falling out? 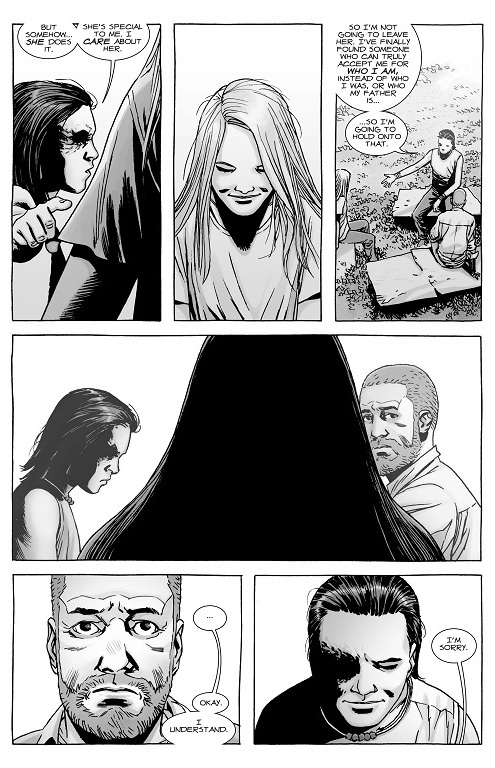 Well, let me clarify: they still see eye-to-eye on many things, but Carl’s brief time with Lydia- and by extension, The Whisperers, I suppose- has given him a fresh, albeit quick, outlook on the path he’s walked and how he’ll move forward from here. Issue 143: “A Union,” is quite the deceptive title. We do have unions and reunions, but we also have a shaky relationship between father and son. But we’ll get to that in a moment, as I want to touch upon some other quick storylines first. Let’s start with Michonne. Or rather, the story concerning Michonne. We’ve known for a while that and Ezekiel have been on shaky ground for some time, even before the time skip, but even now their bond is very fragile. Despite how much time she’s had to spend on the sea, we learn from Pete that she’s still very much a loner. 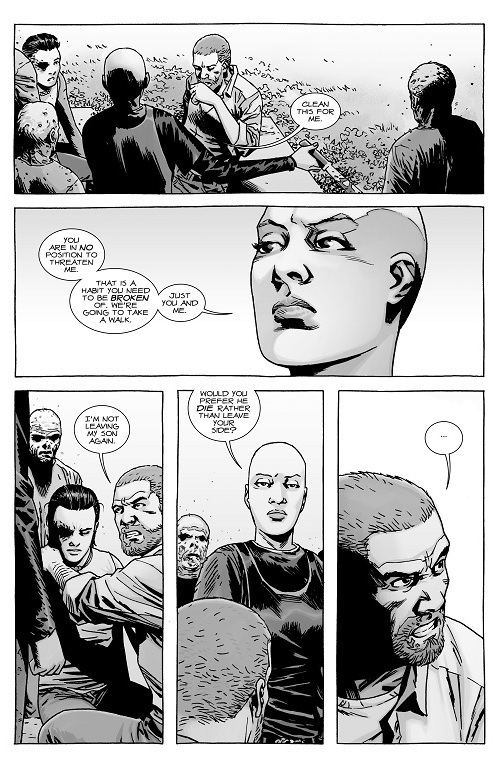 It’s a personality trait that she’s been unable to fully shake off, despite opening up to Rick and the others. Whether she and Ezekiel remain friends or go back to a relationship, I’d like something to happen, and given Pete’s push, hopefully Ezekiel makes a move. I said before that it was interesting how Maggie didn’t mention Gregory’s execution, and at least we know why, as seen through her brief talk with Jesus. Rick had enough on his plate and Maggie wasn’t exactly looking to cause even more friction between the two of them. So at least we know she does intend to tell him. It won’t go over easy, I’m presuming. Rick has been pushing to prove Negan wrong, so to hear that Maggie went against that would be a huge blow to him. 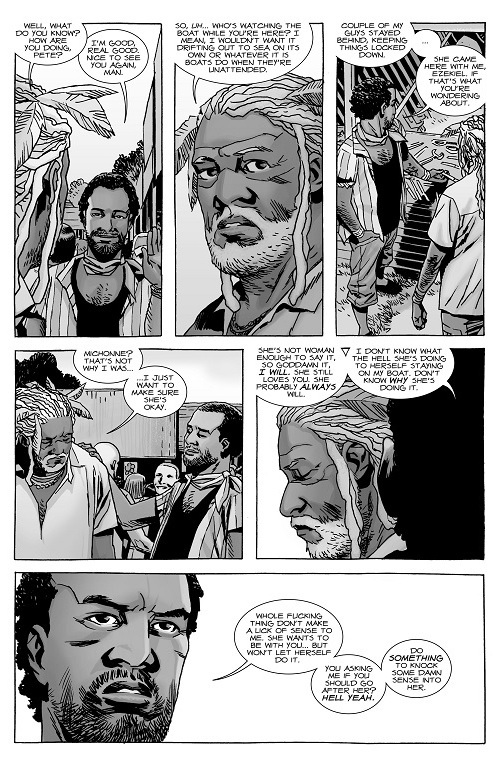 I expect Jesus to be somewhat of a mediator during this confrontation, as he’s the one who eased Rick off and told him that Gregory tried to kill Maggie. 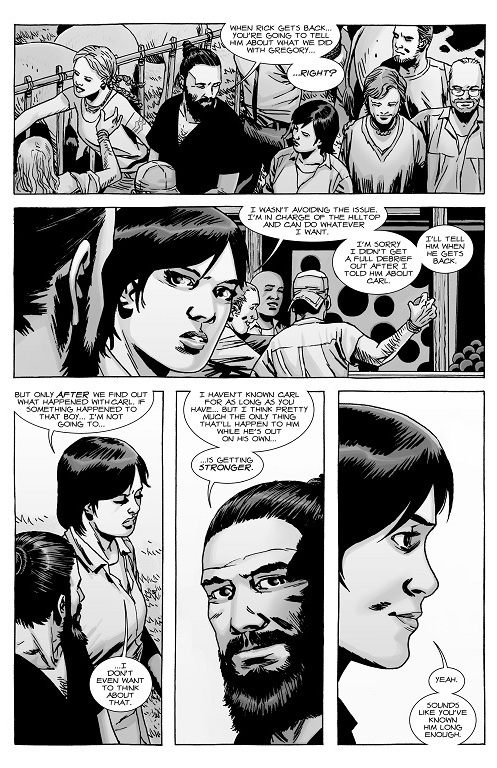 Also, we get a brief appearance of Eugene and Rosita, who are still deep into their relationship, but all is not well. Remember that Eugene is not the father of this baby, but he vows to stay by Rosita’s side anyway. 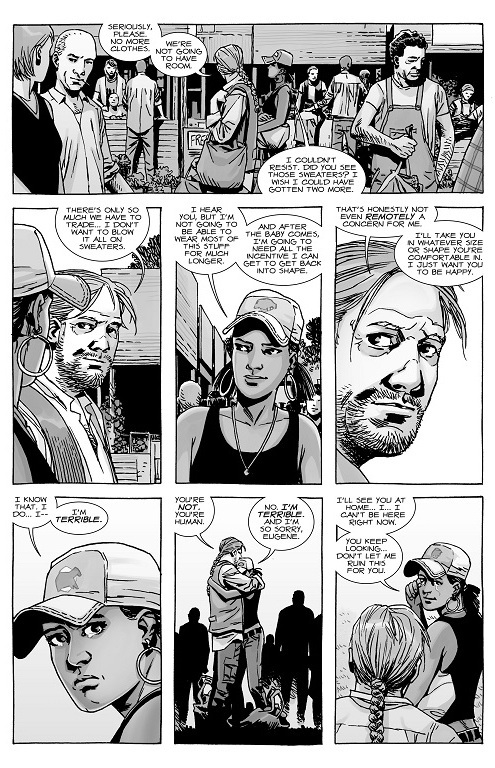 Again, I like how Eugene has more of a leadership role in the community, but he’s still fiercely devoted to Rosita. He even remarks in this issue that what she looks like doesn’t matter to him- he’ll still care for her. Rosita is grateful, but I can’t help but wonder if she feels a bit ashamed of herself as well. Despite all she’s done, Eugene has shown her nothing but kindness and it makes me wonder whether she feels she’s good enough for him because she hasn’t always been the nicest person. Eugene could have walked away the moment he learned that Rosita’s baby wasn’t his, but he’s remained with her because he cares. Now onto Rick and pals on the road. Remember how much Rick blew up at Maggie for not spending more time locating Carl? Well, now he regrets that and mentions to Dante that he doesn’t expect people to risk their lives for his son. How very generous of you Rick, but I don’t really buy this sort of double talk. It was in the heat of the moment that he exploded at Maggie and he even made a fuss that his son should have been worth more than two days. At least be consistent, Rick. You weren’t short with Dante- you were short with Maggie. She’s the one who should get an apology. And then Rick reunited with his son. You know, Carl really gained quite a bit of insight for the brief time he’s been with Lydia and the rest of the Whisperers. But then, part of me wonders if Carl’s speech about Rick Grimes defending everyone isn’t also a comment on Rick’s portrayal in both the comic book and television show. Rick isn’t invincible or untouchable, but he’s damn durable. He’s endured so much and lost friends and family close to him, but he still keeps moving forward. Carl is similar, but ever since Carl lost his eye, he- pardon the pun- sees the world in a different light. It’s the first time we’ve heard him really address this, but he feels that Rick and most of the people around him look at him differently. That’s partially true, as Negan saw Carl for who he really was. He brought Carl into his inner sanctum, despite his appearance, and never thought different of him. 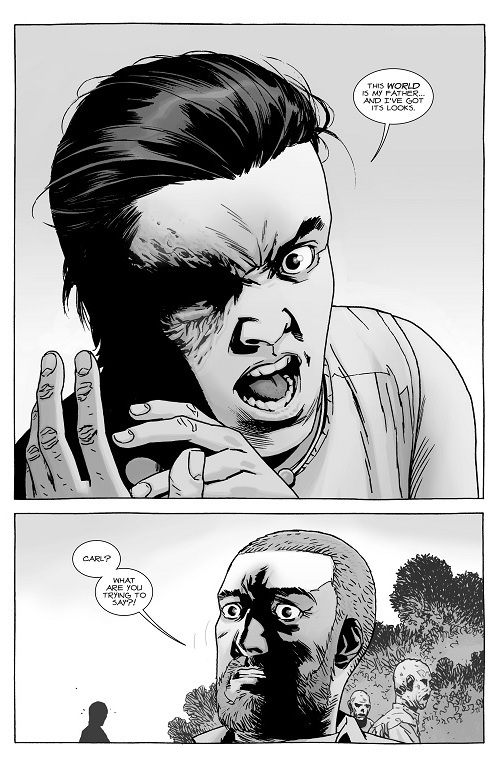 Yes, the shooting has permanently scarred Carl, but Rick hasn’t treated him any differently as his son. Few have, really, so I don’t fully get where Carl is coming from when he says that Lydia sees him for who he is. I don’t want to make this accusation, but I would chalk this up to him still being in love with the girl. He knows Lydia intimately, but like Maggie mentioned a few issues ago, he doesn’t know her that well. He just met her, but already he’s come to the conclusion that Lydia is the one person who can accept him for who he is. Now he’s ready to become his own man and carve out his destiny without- for the moment- his father. Carl, are you out of your mind? You’re in no position to come to this conclusion with someone you’ve just met versus people you’ve known for most of your young life. I don’t recall many people flinching at Carl since his injury. Have any felt uncomfortable? Yeah, probably, but he’s still been accepted as the same Carl Grimes as before. And Lydia’s smile during Carl’s rant looks as if she’s the happiest gal in the world. Yeah, thanks for the being part of the reason for fracturing Carl and Rick’s bond. Oh, but Rick’s not out of the woods yet. Alpha returns from the fair quite sooner than I expected and apparently experienced some trouble on the road. What’s the trouble? 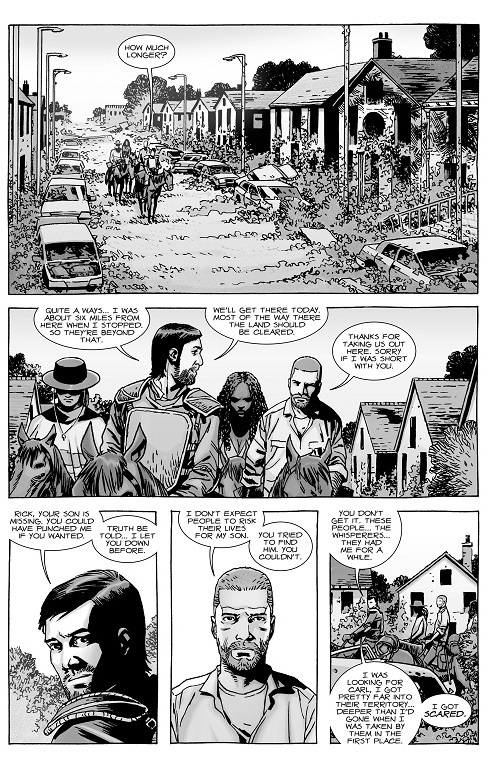 We’re not told, though Rick thinks that something happened to Michonne, Andrea, and Dante. We’ll see. Oh, and by the way, Carl flipped out about Alpha’s disappearance, but we last saw the two talking before Alpha said she needed to learn more about Carl’s group. But anyway, Alpha manages to put Rick in his place by reminding him that he isn’t in a position to threaten, and she’s right. Rick is in unfamiliar territory and he doesn’t have the others by his side. 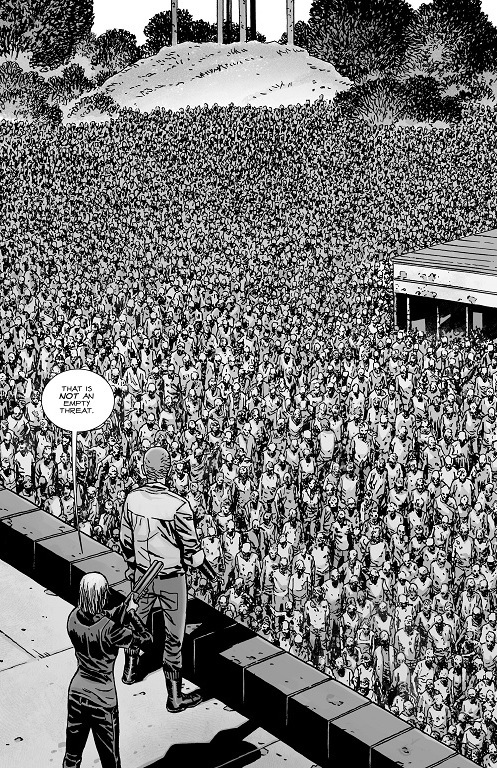 Sure, Carl is with the Whisperers, but Rick already knew from Maggie that Carl went of his own volition. 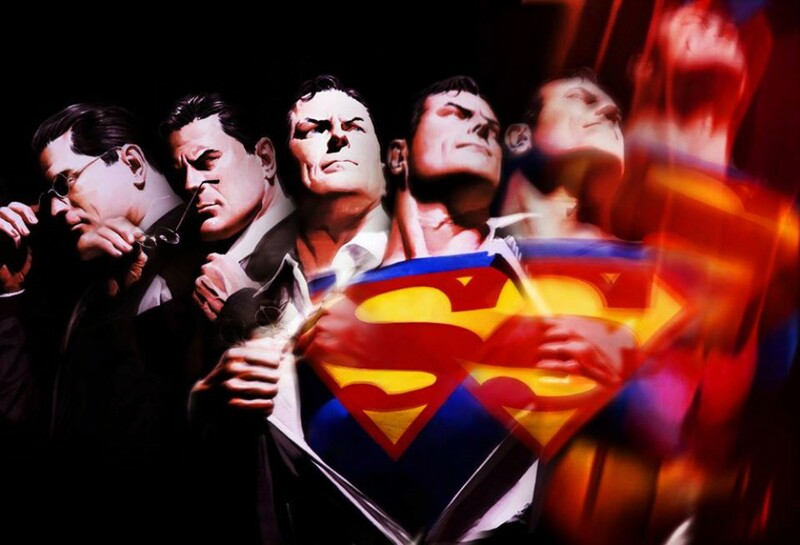 Recognize that you’re outnumbered, outmatched, and don’t try to be a hero. Carl already said he didn’t want to go with you. 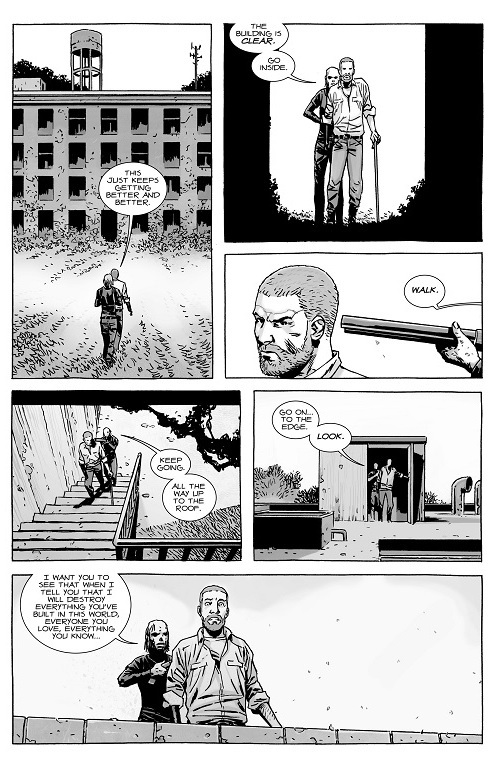 As for the ending, there was a good amount of tension to it, as we had no idea where Alpha planned on taking Rick. But the reveal of that massive horde of roamers was a sight to behold. We’ve seen swarms and herds, but nothing quite like this. At least, not for a long time. It makes me wonder where all these roamers even came from. Did Alpha and the Whisperers manage to corral them to this point or are they just stuck here? Either way, Alpha has a powerful weapon at her disposal or at least a way to prove she’s not screwing around. This entry was posted in The Walking Dead and tagged Alpha, Carl Grimes, Dr. Eugene Porter, Jesus, Lydia, Maggie Greene, Rick Grimes, Rosita Espinosa, Sophia, The Walking Dead, The Whisperers by omarid513. Bookmark the permalink.